Japanese Episode AG 076: "Yajiron to Kiri no Naka no Iseki!" 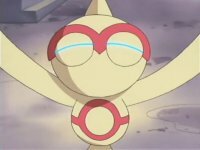 American Episode 348: "Me, Myself and Time"
Satoshi and his friends are traveling through a mist-filled area when the young trainer from Masara Town gets separated from his friends. As he tries to find a way back, he hears a hooded woman singing an eerie lullaby before she mysteriously vanishes. He then spots a Yajiron who, in the thick mist, is about to walk right off the side of a cliff! Satoshi saves it, and afterwards the pokemon's trainer appears; a young girl named Kuruyo. Kuruyo is busy searching for a treasure, so Satoshi decides to help her out. The two go back to the tree where the mysterious woman is and find the entrance to a set of Yajiron-themed ruins. Satoshi and Kuruyo, now joined by the mysterious woman from before, use their pokemon to help remove some rubble that had prevented the older woman from uncovering the ruins' secrets. After an attack by the Rocket-Dan, the older woman reveals herself to be a future version of Kuruyo, and that the treasure she was looking for was "time." After Mirai Kuruyo returns to her own time, Satoshi and Kuruyo part ways. He is able to rejoin his friends and continue on their journey through Houen. This episode was a nice departure from the standard filler episode. I like the weird mythology the anime producers tried to give Yajiron, and the little plot twist at the end was a welcome surprise. I may not find the episode to be too memorable or important, but I can't ignore the attempt to make this episode stand out from the others. The opening pan of the episode is shortened by one second. I think I was able to get most of the English version down, but I'll hold off on typing it up until I can confirm it. A second is cut of the panning shot of the cliff right before Satoshi almost falls off. In the Japanese version, the commercial break falls during the scene where Satoshi and the others fall toward the ruins. We see them sliding down the tunnel, the commercial break comes and goes, and then we see the footage of the group falling down the tunnel again. 4Kids just cuts one of these tunnel-sliding scenes. When the Team Rocket's mecha is coming toward Ash, he says something to the effect that since the mecha is made out of steel, Pikachu's electricity will work on it. In the Japanese version, Satoshi just says that because Yajiron is part ground-type, Pikachu's electric attacks won't damage it. A second is cut from Kids' WB! 's final commercial break.